Comments on the draft State Rail Plan are due TODAY. UPDATE | 2/6/2018 | MassDOT announced today that the comment period for the Rail Plan has been extended to March 2nd. In this posting we’re going to take a look at draft 2018 State Rail plan that was released by the Massachusetts Department of Transportation (MassDOT) on Friday, January 26th. Before we go any further we want people to understand that MassDOT is currently seeking written public comments on the draft plan. If you are interested in the long-term plan for passenger rail service in the Commonwealth — in the Pioneer Valley in particular — we encourage you to review the draft plan and then send your comments to MassDOT. This will be the only chance to comment on the State Rail Plan until the next update in 2023. Comments must be submitted by February 19th March 2nd. Note that the State Rail Plan does not include policy decisions regarding specific MBTA Commuter Rail investments, given several ongoing studies pertaining to the future of Commuter Rail. These studies include Focus40, the long range investment plan for the MBTA — and the MBTA Commuter Rail Vision study. As you read along please keep in mind that these comments, for the most part, only focus on our region. We encouraging all interested parties and stakeholders to have a close look at the draft State Rail Plan and to provide MassDOT with comments and feedback. This is the time for your voice to be heard. To get started we suggest that you look at the map below. This map shows the existing passenger rail network in the Commonwealth. The problem with this map is that it doesn’t show you the frequency of service (i.e. the number of trains operating) on each line. As example, the map shows that there is service from Boston all the way to Albany, but what the map doesn’t show is that this service consists of a single long-distance Amtrak train in each direction. The map though does give the reader an idea of which rail lines are currently being used for passenger service. Now lets look at the draft recommendations from the plan. This is MassDOT’s support for the CTrail Hartford Line service which is scheduled to start service in May 2018. Long-term plans for this service should include the upgrade of the line from CT-MA border into Springfield (e.g., at grade crossings), renewal of the track-level infrastructure at Springfield Union Station, and creation of a proper layover yard for CTrail and Amtrak trains in Springfield. For reasons that are not clear the draft plan is silent on all of these projects. We encourage people to fully support expanded passenger rail service between Springfield and New Haven. Clearly this is very exciting news for people living north of Springfield. The proposed pilot service, as we understand it, would effectively provide for two trains from Greenfield to New Haven in the early morning and two trains from New Haven to Greenfield in the early evening. These trains would be timed to connect with Metro-North, Amtrak and Shore Line East service in New Haven. The proposed trains would stop in Greenfield, Northampton, Holyoke, Springfield and all Hartford Lines stations in Connecticut. If the near-term pilot moves forward and were to be successful, added intercity rail service could be achieved as an extension of the CTrail Hartford Line creating continuous service from New Haven, Connecticut to Greenfield. This service would improve access for the institutions and residents of this corridor and would leverage the investment that the Federal government and the Commonwealth have already made in the Knowledge Corridor. Expanded passenger service along the Knowledge Corridor would also support transit oriented development opportunities along the corridor. We encourage people in our region to let MassDOT know that they support this service. On the one hand it is very unfortunate that MassDOT has decided to further delay the solid recommendations that came out the two-year Northern New England Intercity Rail Initiative study that was completed in 2016. i.e., the extension of New Haven – Hartford – Springfield passenger rail service to Boston. 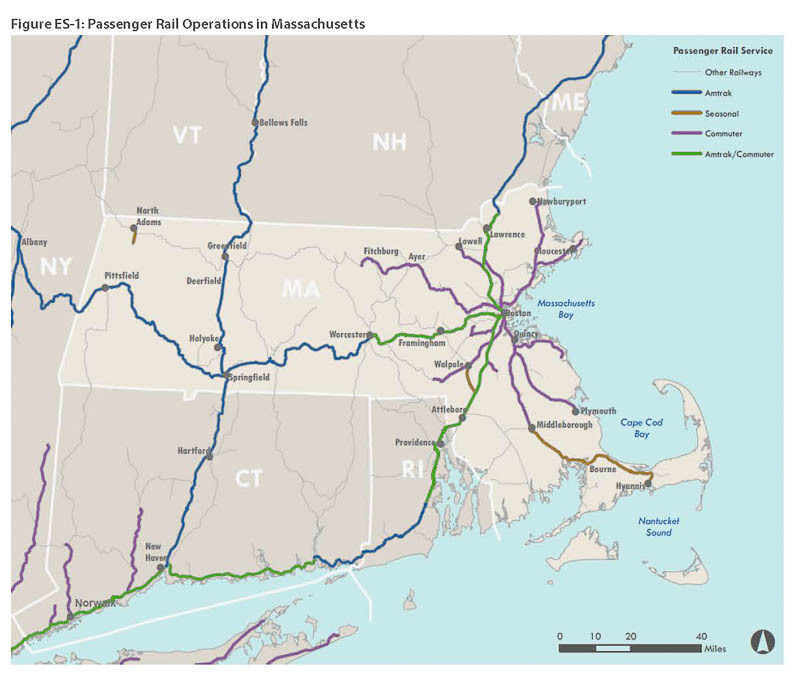 We would be surprised to hear that MassDOT supports all of these options in the proposed Western Massachusetts to Boston Passenger Rail Service Study, but they should all be looked at since none of them would require any new railroad right of way. At a minimum we strongly support moving forward with the establishment of a passenger rail corridor that would connect the CTrail Hartford Line service (New Haven — Springfield service) with Boston — with appropriate intermediate stops. If passenger rail service between Western Massachusetts and the Boston Metro area is important to you we recommend that you let MassDOT know this in your comments on the draft State Rail Plan. The Northern New England Intercity Rail Initiative study that was completed in 2016 recommended the establishment of a passenger rail station in Palmer when service is established on the corridor between New Haven, Springfield and Boston. We continue to support the establishment of a properly located station in the town of Palmer when expanded passenger service is established along this corridor. We are pleased to see that MassDOT has identified the need to upgrade key freight rail lines in Massachusetts to accommodate 286,000 lbs. gross weight freight rail cars as a Tier 1 Priority Project — in particulate on the New England Central Railroad (NECR) corridor that runs through the Pioneer Valley. We are aware of a number of freight customers along the NECR line who are eager for the upgrade of this rail corridor to be completed. June 14, 2016 | State Rail Plan Update public meeting | Worcester, Ma. November 9, 2016 | State Rail Plan Update public meeting | Springfield, Ma. November 21, 2016 | State Rail Plan Update public meeting | Attleboro, Ma. January 29, 2018 | State Rail Plan public meeting | Worcester, Ma. February 2, 2018 | State Rail Plan public meeting | Springfield, Ma. The State Rail Plan should have been finished back in late 2015/2016 rather then delayed until 2018. Why the delay? We don’t know. For reasons that we don’t know the draft 129-page draft version of the plan was not released until 4 pm on the Friday afternoon (January 26th) before the planned public information meeting in Worcester on Monday, January 29th — leaving people with little time to review the document before the meeting. On a more positive note, many were pleased that MassDOT agreed, after the first public meeting, to add a second public meeting on Friday, February 2nd in Springfield. We hope that when MassDOT completes the final plan that they will also release a redline version so that interested readers can see exactly what changes were made, between the draft and final version of plan. We would also hope that MassDOT will post a summary of the comments that are received, as they did with the 2017-2021 Capital Investment Plan. Local rail advocacy groups Trains In The Valley, Citizens for a Palmer Rail Stop and The Train Campaign announce plans to hold pop-up meetings across the region. Join us an informal drop-in meeting to learn more about the now-in-draft 2018 Massachusetts State Rail Plan. Get your questions answered by local rail advocates and learn how to make your opinions count by submitting comments to MassDOT. Please note that we are no longer accepting requests for additional pop-up meetings.